You won’t have to look at that faded plastic much longer. And here is further exciting news from the Albany infrastructure beat. Well, maybe not exciting but at least mildly interesting to those who have complained about the sad shape of the Main Street roundabout built in 2014. Since it was finished in the fall, the center island of the traffic circle has been adorned with an orange garland of plastic construction fencing and a scraggly crop of weeds. This was while the city considered an elaborate proposal to decorate the place with a brick and iron fence and appropriate signage. 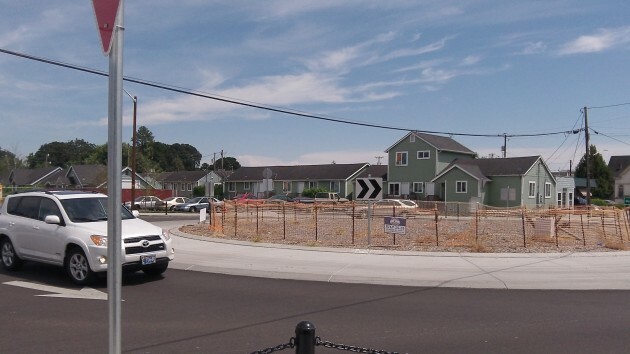 That plan proved too expensive even for CARA, the downtown urban renewal district, which decided to go with standard roundabout landscaping instead, the approach previously used at roundabouts on North Albany and Knox Butte Roads. Bids were opened in June, from Anderson’s Erosion Control Inc. of Junction City for $31,490, and from American Landscape & Irrigation of Albany for $49,093. The city engineer’s estimate had been $35,000. Anderson is being awarded the contract administratively because it’s not big enough to warrant council action. “We don’t have a start date yet from Anderson but I wouldn’t be surprised if they waited until September given the hot weather,” reports Staci Belcastro, an engineer in the Public Works Department. The completion date is Sept. 18. Uplit trees of a small diameter and other vegetation that is low maintenance would be an excellent choice. Iss that September 18th 2015 or September 2018???? I can’t imagine how the trees and possibly plants aren’t going to block the view to some extent. Isn’t it a concern that tree roots will start cracking the pavement, some years down the road?